Team CrossFit Mayhem Freedom of CrossFit Mayhem in Cookeville, Tennessee, is the back-to-back 2015 and 2016 Affiliate Cup Championship team. It is the second team in the history of the CrossFit Games to win the cup twice (the first was team Hack’s Pack Ute, the winner in 2012 and 2013). 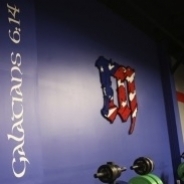 The team made its Games debut in 2013 with a 27th-place finish, rising to notoriety in 2015 when four-time CrossFit Games champion Rich Froning, the owner of CrossFit Mayhem, retired from the individual competition and joined his own team. CrossFit Mayhem Freedom earned its way to the Games with Central Regional victories in 2015 and 2016, retaining five of its six members across both years.